Last weekend we headed out for a 7 day 3 campground excursion with 2 other couples. I affectionately called it the 7 day hike but after day one we were not sure we would still be walking. 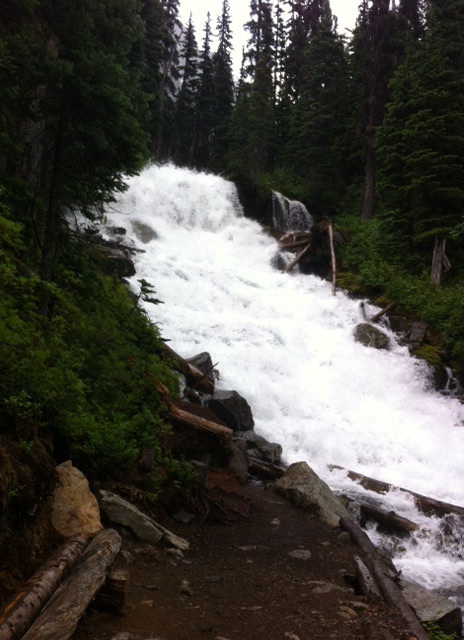 4 of us arrived at Nairn Falls Provincial Park in Pemberton, BC and after arrival I explained my 7 day hike theme. As a group of campers who call bocci exercise, you can imagine how well received my idea was but they are all troopers and appeasingly agreed. I have a friend that writes a hiking blog, Hiking for the Scaredy Cat, and she has always said Joffre Lake is one of her favourite hikes. Being only 30 minutes away from our first campsite, it was settled, that would be our hike. I had not done any research on this trail but it was never mentioned in the same conversation as The Chief or Black Tusk so I assumed it was a light to moderate hike. 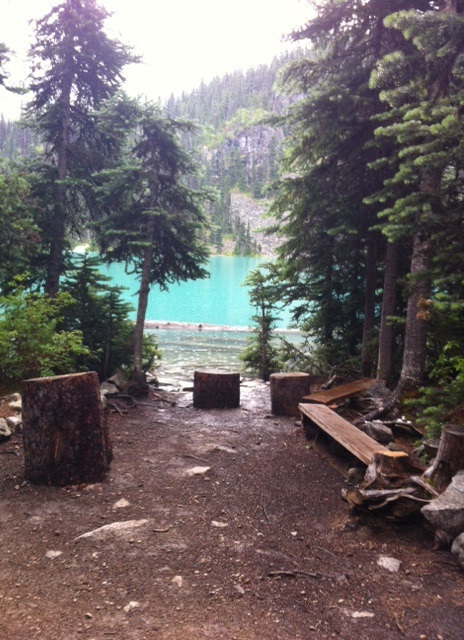 Joffre Lake Provincial Park is located about 30 minutes outside of Pemberton on the Duffy Lake Highway. The parking lot is right off the highway and that is the starting point. This hike is made up of 3 lakes with the first being about a 400 meter stroll from the parking lot. If that is all you have time or fitness for it is worth it. The lake is glacier blue with majestic glacier mountains in the background. From there you head to the second upper lake which is about 4 km away. Now the word upper should have been our hint but we didn’t really think about it. Blair causally mentioned he had heard it was an up hill hike but that it wasn’t bad, so off we went. At about 1/2 a km we started to ascend. 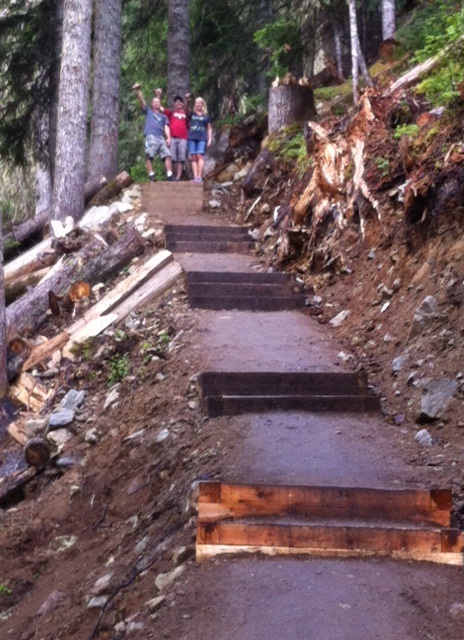 At first it was a slow gradual climb but soon we realized our tickers were in for a work out. The steep ascent is only about 2 km but we all found it challenging as demonstrated by the lapse in conversation while we used our energy to walk. To help with your footing the park provided steps that enclosed many of the rocks but these were high steps and tough on your cardio and leg muscles. The trail is an “up and back” route so we passed several other hikers coming down but I wouldn’t say it was a busy hike. It was also Monday so that likely helped with the traffic and allowed us to set our own, easy, pace. 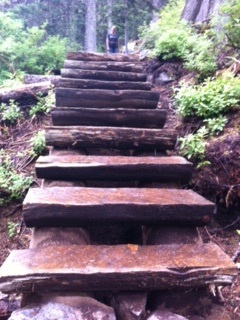 After the 2 km steep stair master climb we levelled off back to a moderate trail slope that guided us to the lake. The view of the second lake was breath taking. 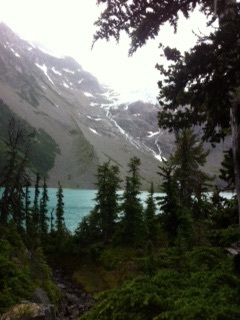 It also featured beautiful turquoise glacier water and a much closer view of the mountain background. As well the stream where the glacier water enter the lake was peaceful to listen to and beautiful to watch. The trail runs along the lake side with a rope swing and small beach areas for those who so dare. It was raining the day we hiked so we didn’t partake in the swimming part of the adventure. 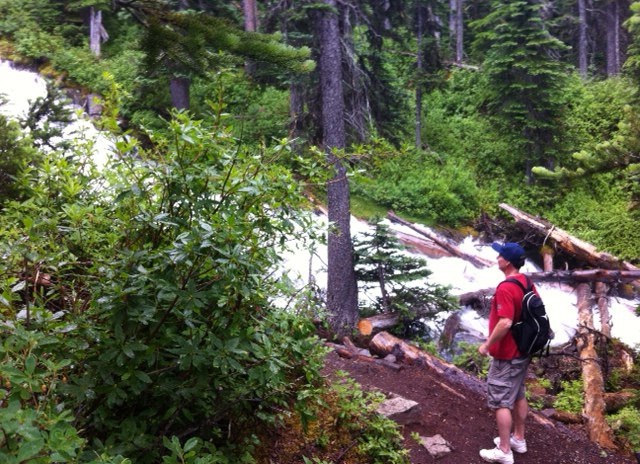 Oh ya, that and the freezing glacier waters helped us decide to stay on the trail. We then came to the sign advising us the 3rd lake was another 1.5 km. We all debated whether to proceed or not but in the end it was decided we would regret not completing our journey so we persevered. Off we headed and about 1/2 way we approached the rushing sound of the waterfall. As it came into view we were able to watch this forceful waterfall pounding water down the rocks heading for the lake. In my opinion, the waterfall is the highlight of this part of the hike, so if you need heading back now would be okay. Not knowing that and being stubborn we continued on to the third lake. It was another beautiful lake but did. It appear as turquoise and there was not real view area. After a short break and some photos we headed back. The trip down was hard on the knees but much easier in the heart. The sun came out by this point so we took the opportunity to take a few more photos. The round trip took us 2 hours and 20 minutes including all our photo (aka breathing) stops. I would rank this hike as a must do. It is beautiful and really makes me appreciate the area we live in. Glad the 3 couples had a great time. Such lovely photos of the lake, looks like a lovely hike! It was, a bit tougher than I had expected but worth it. I love Joffre Lake area. It’s one of my favourite places for hiking. So beautiful! It was my first time there and it is stunning. The water color is only believable in person and the views were postcard perfect. Loved it. Thanks, we tend to seeks out waterfalls. There is something so magical about them. I agree. I think for me, there’s also the sense that if I get to a waterfall on a hike, I actually saw something. It gives me a sort of destination to aim for (and tell people about when I get back!). 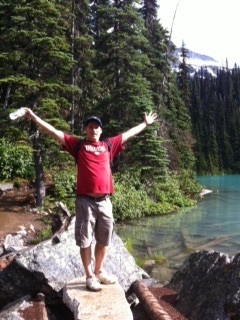 I loved Joffre Lake! The hike was challenging and I nearly quit like a million times (OK, OK more like 5 million), but I’m so glad my friends encouraged me to keep on going. The views were spectacular! I felt the same way but every time I look at the photos I am so glad I did it. The views are spectacular.